By Craig | December 18, 2018 | This post may contain affiliate links, which means we may receive a small commission, at no cost to you, if you make a purchase through a link. Read our Disclosure. While Tasmania is Australia’s smallest state, it packs a punch and has loads to offer. 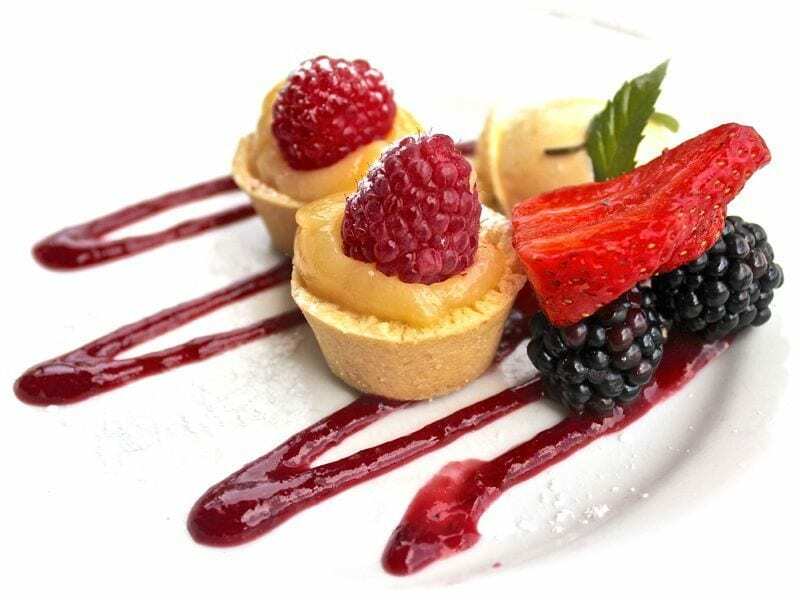 Historic towns, World Heritage Listed wilderness areas, pristine beaches, rugged coastline, gorgeous mountains, hiking, wildlife and a terrific food and wine industry that will make your taste buds EXPLODE. We took our car over on the Spirit of Tasmania car ferry and spent a month driving around Tassie. If you don’t take your own car over simply fly in and grab a rental car, doing a road trip is the best way to explore the island. Of course you can fly in and just visit Hobart or Launceston over a weekend. But then you would be missing out on the BEST of Tasmania. Give Tassie at least a week, or three and get to know as many of the below places as possible. Even though it’s a small state it does take longer to drive around than you’d anticipate, so don’t rush, but slow down and take more in. 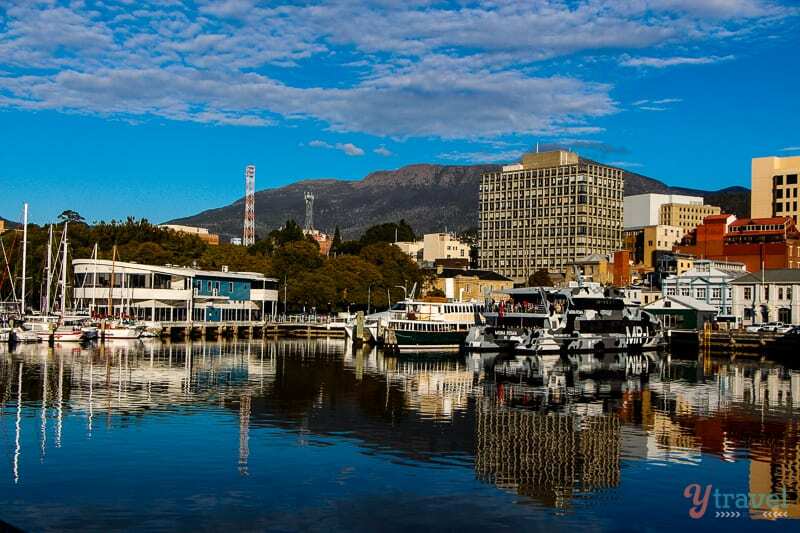 Hobart is charming, inviting, walkable, and one of Australia’s oldest cities with lots to do in and around the area – we spent 6 days here. The history is still alive with its 19th Century sandstone warehouses that now serve as cafes, restaurants and artists’ studios. Quaint cottages and colonial mansions are all over the small city. And then there is the backdrop of Mount Wellington rising above the city and the River Derwent racing through its heart. Get a dash of history by wandering around the historic harbour, Battery Point, and Salamanca. And of course there is the incredible MONA museum. We have stayed at the Salamanca Inn and enjoyed the location and apartment style accommodation. Find your Airbnb rental in Hobart here. Historic Richmond is a lovely small town within easy reach of Hobart (25 km north east) to spend a few hours exploring the historic sites. We took a stroll along the river before grabbing a bite to eat at the Richmond Arms Hotel, followed by coffee and cake at the popular bakery. 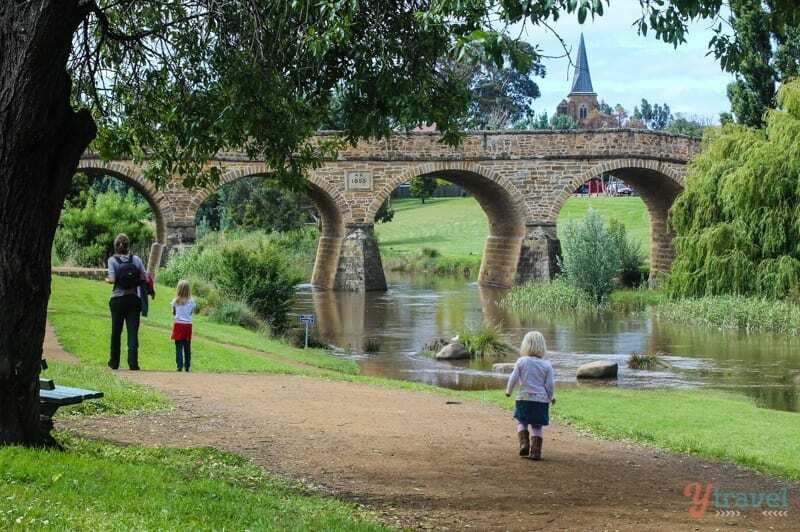 Richmond is home to Australia’s oldest bridge (built in 1825) and Australia’s oldest Roman Catholic church, St John’s. You can also check out the Richmond Gaol and just wander around town looking at the numerous heritage-listed buildings. If you like food and wine, you might like a Richmond food and wine half day tour from Hobart through Get Your Guide. Looking for history, drama, beauty and sadness? Port Arthur is where you’ll find it in spades. Port Arthur has a violent and troubled history as a penal colony for some of Australia’s hardened convicts. It’s one of the best things to do in Tassie and if you’re based in Hobart it’s accessible via a day trip. And for a great bite to eat on the way, don’t miss the Doo-Lishus food truck at nearby Eaglehawk Neck for the best fish and chips in Tasmania, plus homemade scallop, rabbit, and venison pies. Get your tickets for the ghost tour here (one of my favorite Port Arthur experiences). 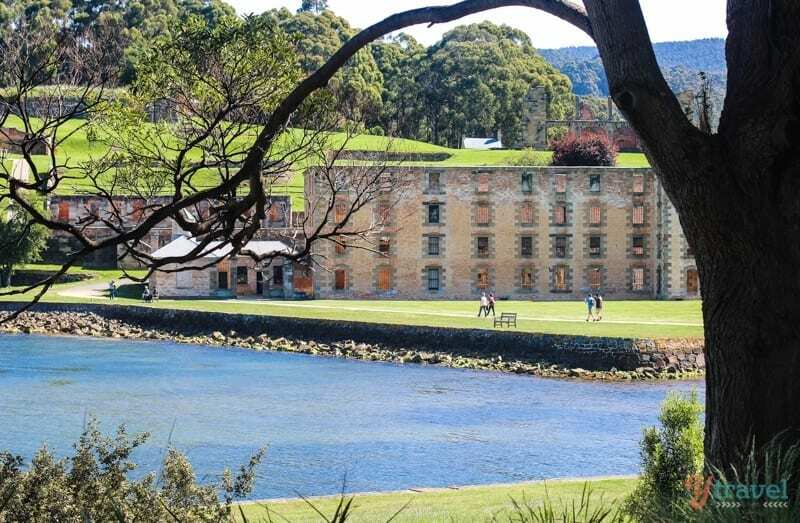 If you need to take a tour from Hobart to visit Port Arthur, check out this tour here. 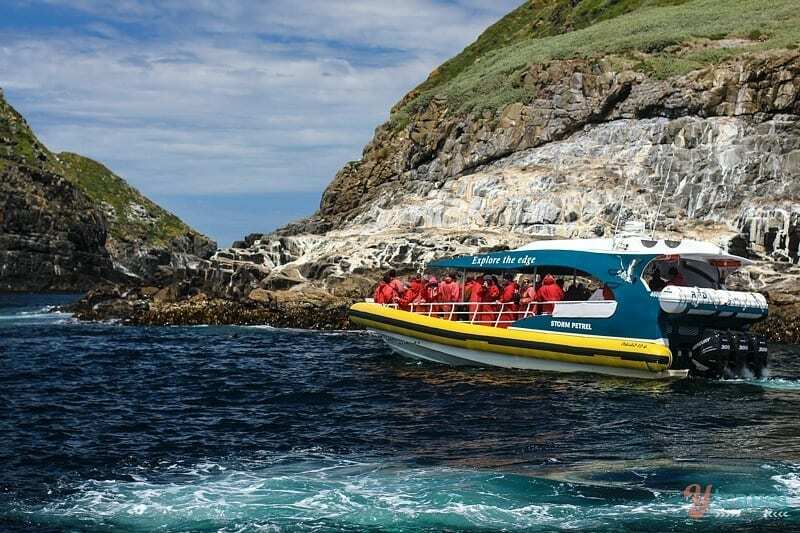 Ruggedly beautiful with towering sea cliffs and deep sea caves, fur seals, fairy penguins, an abundance of bird life and if you’re visiting in the right season, the opportunity to see migrating whales. 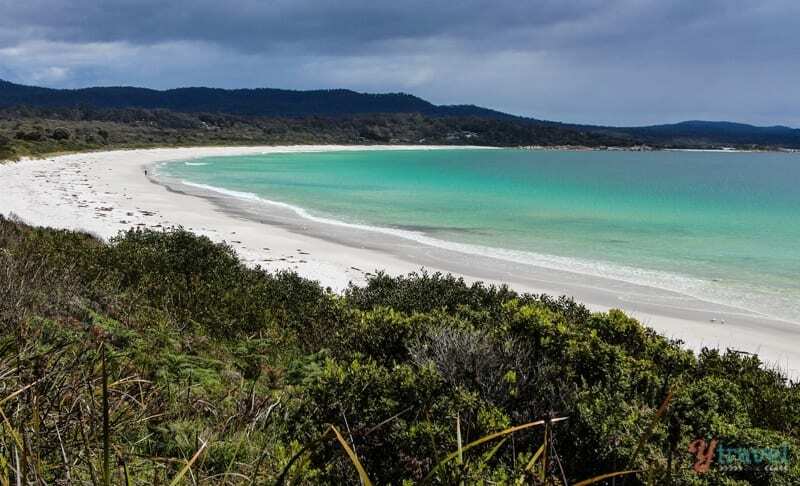 Bruny Island is an easy day trip from Hobart, and the best way to experience Bruny if you only have half a day is with local legend Rob Pennicott from Pennicott Wilderness Journeys. This is the tour we took with Rob Pennicott. It’s one of the best tours we did in Australia. Coles Bay is set in a spectacular location with uninterrupted views of the red and pink granite peaks known as The Hazards. It’s a small town with a few shops and cafes – don’t miss Tombolo Restaurant and coffee bar for great coffee + wood fired pizzas with stunning views. This town is mostly known as the gateway to Freycinet National Park (our favourite place in Tasmania). Nearby Honeymoon Bay is brilliant and consider going kayaking in the beautiful bay. 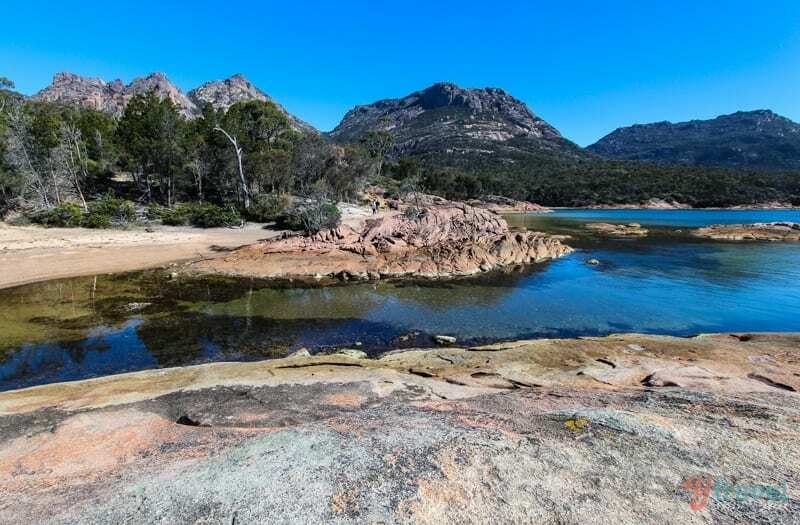 We could easily spend a week based here exploring Freycinet and all its walks. One of our top three in our list of 25 National Parks in Australia to set foot in. 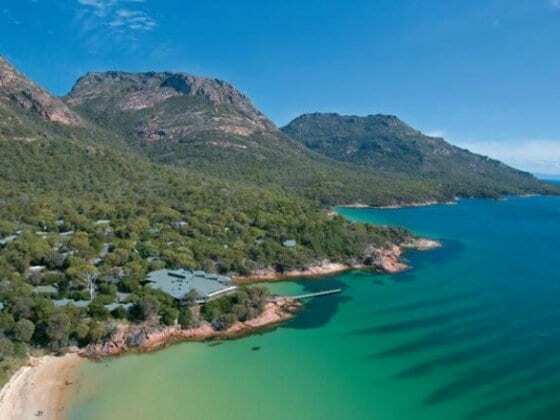 Freycinet is spectacular, a peninsular of pink granite mountains, pure white beaches, coastal dues and dry eucalypt forest. 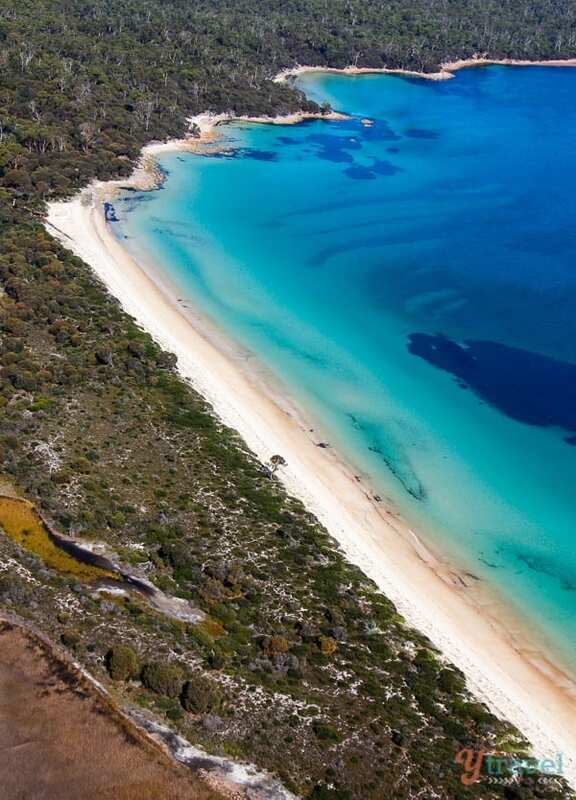 Within this peninsular is the famous Wineglass Bay – a beach consistently rated as one of the world’s best. Three pink granite peaks – the Hazard mountains – rise dramatically, protecting the bay from the infiltration of humanity. And Hazards Beach, a beach that is pure, remote, desolate, peaceful, and breathtaking. Both those beaches feature in our 38 best beaches in Australia list. 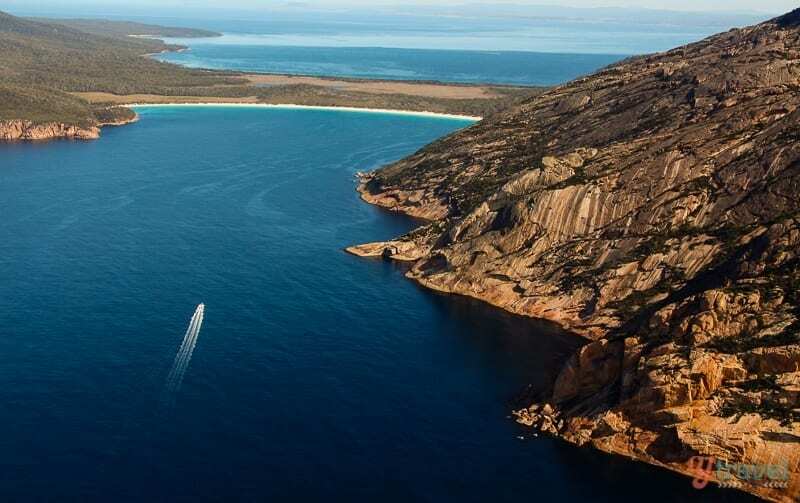 Freycinet is a 2.5-hour drive from Hobart. 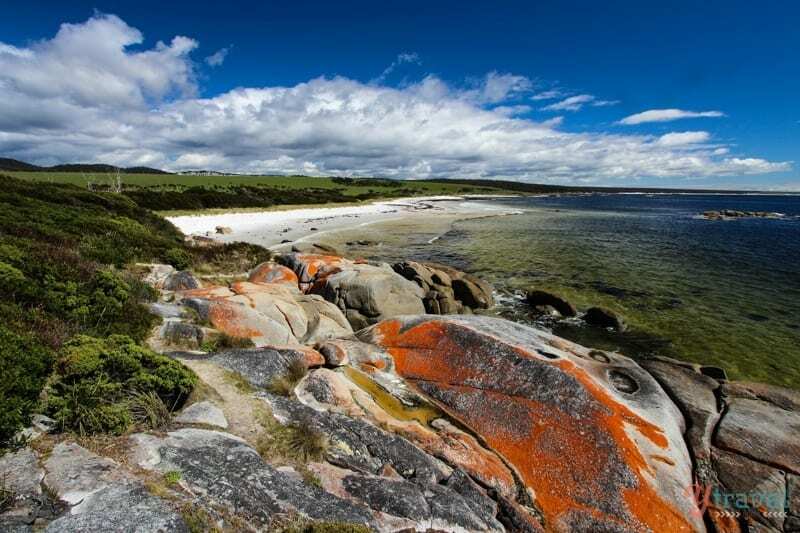 On the north-east coast of Tasmania, the Bay of Fires is a region of pristine white beaches, blue water and these incredible rock formations (orange-hued granite) in which the colour is produced by a lichen. It’s widely regarded as one of the most beautiful places in Tasmania. And we pretty much had the whole place to ourselves. It’s a two and a half hours drive from Launceston, or base yourself in St Helens or Binalong Bay. 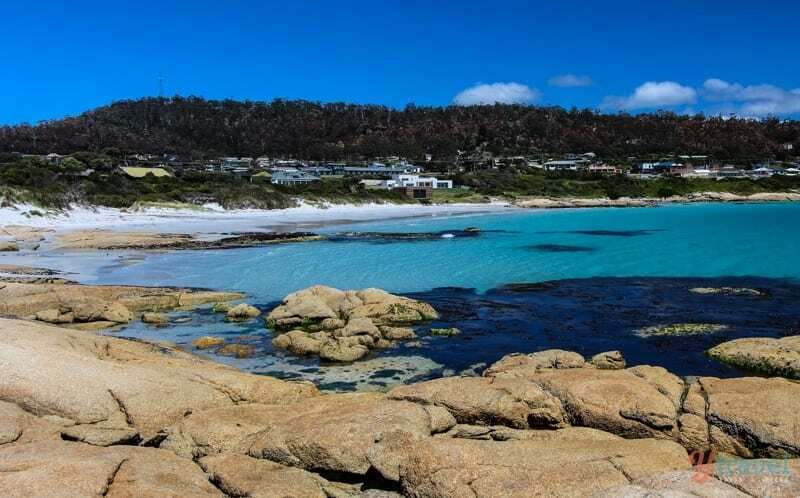 Once you’ve photographed the Bay of Fires and played on the beach at Binalong, be sure to hit up the Binalong Bay Cafe for great coffee and delicious desserts, complete with an awesome view of the beach. We only stopped for lunch in Bicheno but wished we’d planned a night. The beach is a pleasant surprise, just beautiful, as is the coastal walk around to the rocky headland overlooking the bay. The town is primarily a fishing port popular with holidaymakers and retirees for its mild climate and sunny weather. Bicheno is also a well-known place for seeing the fairy penguins. Home rentals are the best type of accommodation in the Bay of Fires area. Check Airbnb here. Getting to Strahan on the west coast of Tassie involves a decent half to full day of driving (depending on where you’re coming from) but it’s definitely worth the effort. 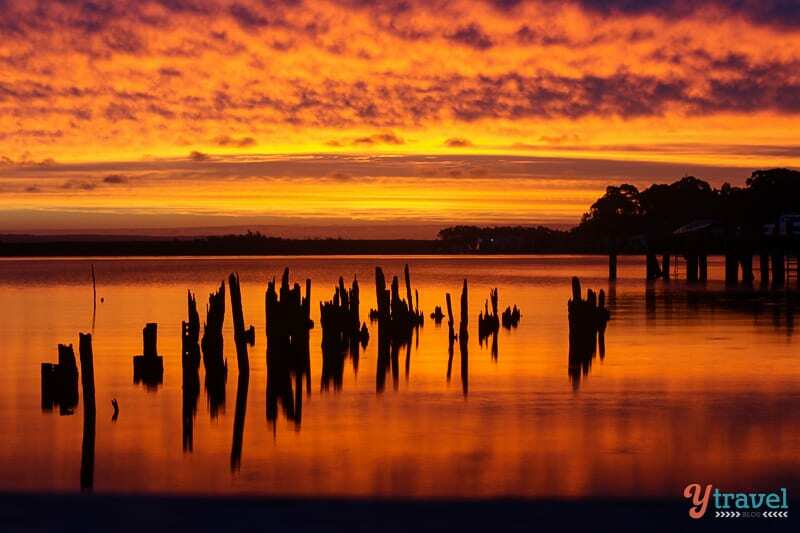 Strahan is a small port town with one of the best sunsets we have ever seen anywhere, and from where we did our cruise down the famous World Heritage Gordon River, one of the highlights of our month in Tassie. Grab your tickets here. Remote, quiet, small, and a true wilderness experience that’s Corinna. 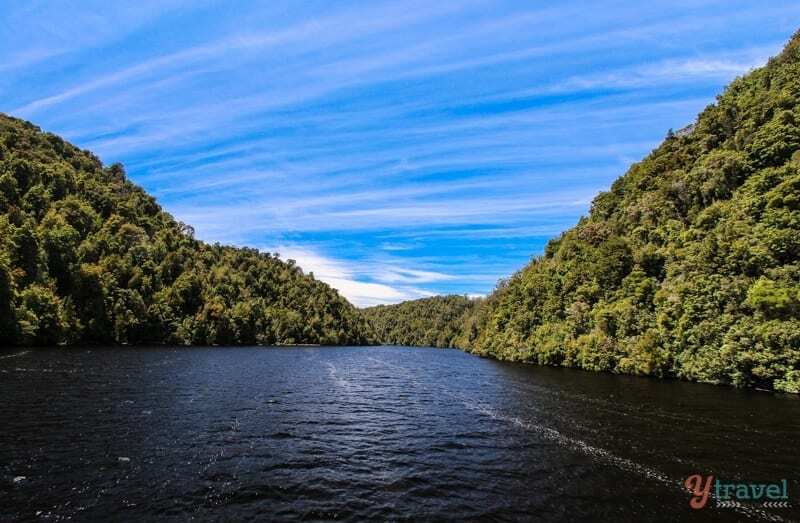 It’s a former mining town on the banks of the Pieman river and at the end of the Tarkine (the largest temperate rainforest in Australia) and the northernmost point where the famous Huon pine grows. Stay in a rustic cottage, walk amongst the rainforest, kayak down the river or take a cruise on the historic Arcadia II. Access to Corinna is by barge boat (if coming from Strahan) and is a unique experience in Tasmania away from the mass tourism. Situated on the shores of Bass Strait, Penguin is the best town to base yourself to explore the north-west region of Tasmania. We really enjoyed the vibe of the town, Kalyra liked the big Penguin dressed in a Santa suit, and the local markets were a hit with Caz. 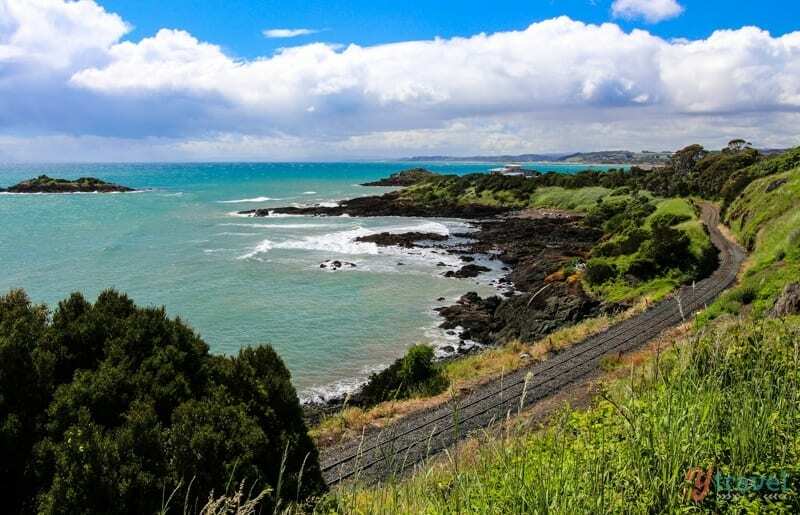 Don’t miss the nearby Turners Beach Berry Patch (great for the kids), Hellyers Road Distillery in Burnie, the Nut in Stanley and the coastal drive to Ulverstone. We stayed at the Penguin Waterfront Escape Apartments right in the centre of town with awesome views over Bass Strait. One of the most iconic destinations in Tasmania, Cradle Mountain is in the Cradle Mountain-Lake St Clair National Park. 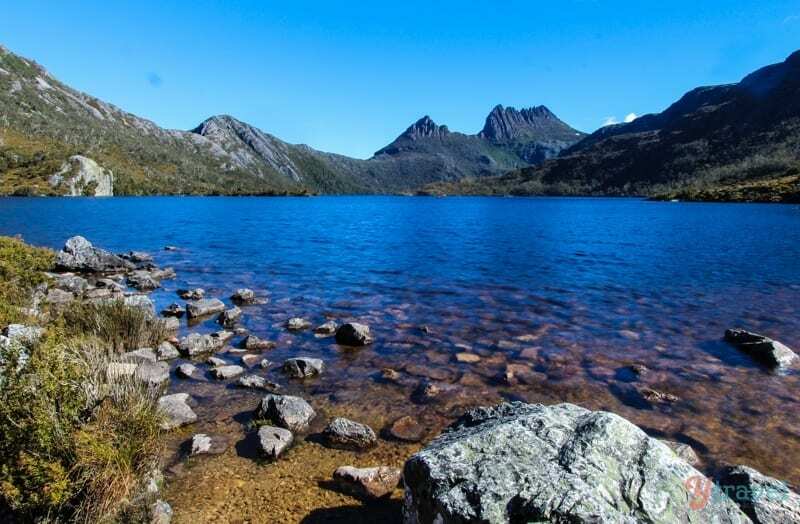 There are over 20 different self-guided walking tracks, ranging from 20 minutes to 9 hours, including the world-famous Overland Track, a magnificent 6-day walk that takes you through the heart of some of the finest mountain terrain. This area is also great for spotting wombats in the wild all year round, they even like rolling around in the snow. Cradle Mountain is 1 1/2 hours drive from Devonport, or 2 1/2 hours from Launceston. If you don’t have your own car, you can take this tour from Launceston out to Cradle Mountain. 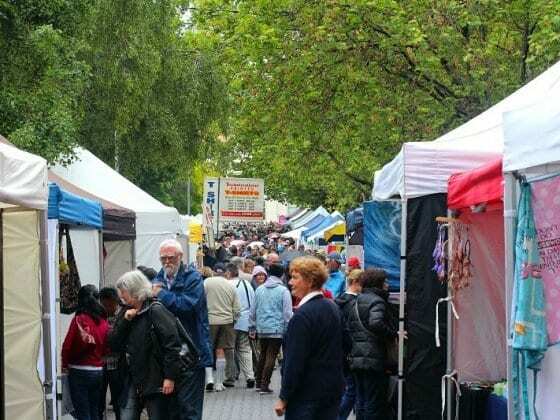 There’s not a whole lot going on in Launceston itself, but it’s a great base to explore some excellent places nearby, and it’s also the cheapest city to fly into from the Australian mainland. 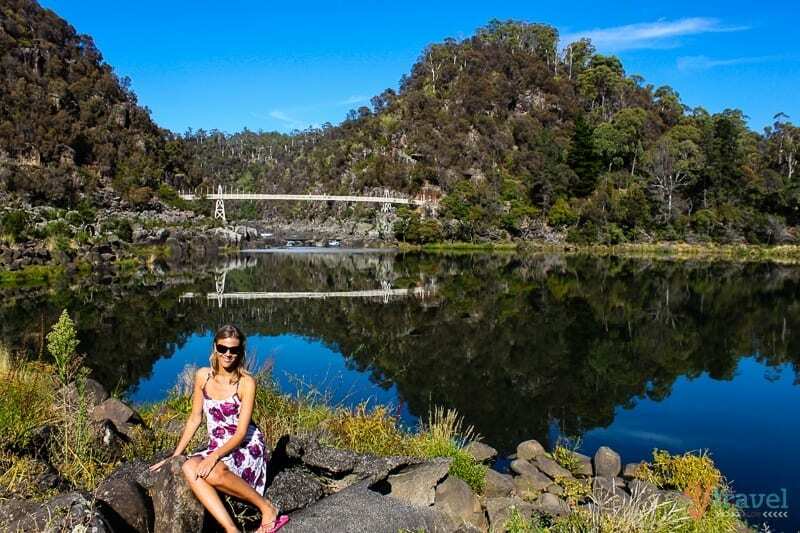 Once you’ve had breakfast at Fresh cafe, seen City Park, the James Boags Brewery and done the Saturday Harvest Market, the best nearby attraction is beautiful Cataract Gorge. The Gorge, as the locals call it, is just outside of town. It’s hard to believe such a beautiful gorge exists merely minutes from the city centre, no wonder it’s a locals favourite. Take in one of the leisurely walking or hiking trails, or jump on the world’s longest single span chairlift, go abseiling, and spot wildlife. When you arrive in Evandale you feel as if time has been wound back 100 years. It’s a National Trust classified Georgian village with unspoiled heritage buildings making it a popular place for tourists and easily accessible from Launceston. 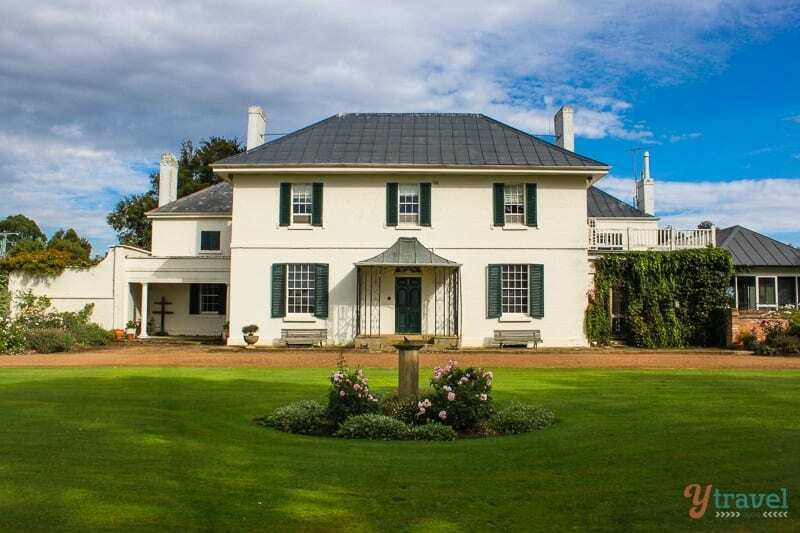 Clarendon House, just outside of the village, is said to be one of Australia’s greatest Georgian houses. We devoured a coffee and cake at the Ingleside Licensed Bakery Cafe located inside the old Council chambers built in 1867. Sit in the pretty courtyard bursting with flowers or, in the winter, by the cozy fire inside. Brickendon Estate is a convict World Heritage Site near Launceston, and Brickendon’s uniqueness lies in the fact that it is still a lived in and working farm with a rich Australian history of convicts and free settlers working together and a landscape that remains virtually untouched for 200 years. Smokehouses and ovens, outhouses, and shearing sheds can still be explored and the old blacksmith shop is left as it was in the 1930’s. You can stay over at Brickendon in historic cottages and rustic cabins. Sit by an open fire and wake up to stunning views overlooking the paddocks. Just 10 minutes drive north of Launceston brings you to The Tamar Valley, a wine region known (secretly) as one of the best wine regions in Australia. The Essential Travel magazine (UK) named the Tamar Valley Wine Route as “One of the top 10 wine routes in the world”. The cool climate the area enjoys is perfect for producing high quality and elegant wines, our favourites being at the Ninth Island and Moores Hill. There are plenty of local pubs, restaurants and cafes scattered along the area including our favourite the Ilk cafe. And don’t miss the the Tamar Island Wetlands Walk. There is hot debate amongst Tasmanian as to what is the best waterfall in Tasmania: Liffey Falls or Russel Falls in the south of the island? We didn’t get to Russel Falls, but we can recommend you go see Liffey. 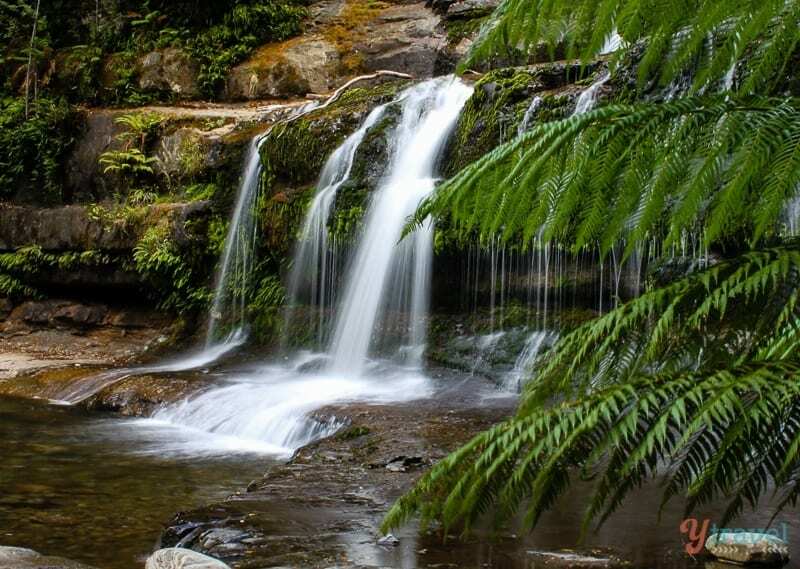 This is another one of Tassies World Heritage Areas, and a 40-minute walk in the forest will bring you to Liffey Falls within the Liffey Falls State Reserve, an area of cool temperate rainforest, featuring myrtle, sassafras and leatherwood on the slopes of the Great Western Tiers. No, not a town, but almost a destination in itself. 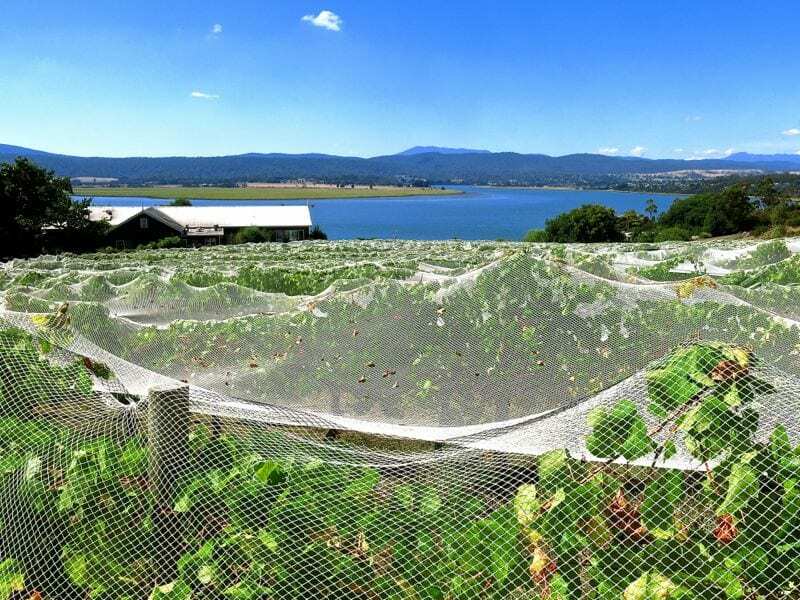 When we asked our Facebook followers for tips on things to see and do in Tassie, so many of them recommended the Raspberry Farm Cafe and said we must go there. The stone and timber café overlooks lush green lawns running down to a lake filled with water lilies. The garden features native trees and a herb garden overlooking the raspberry canes in the distance. 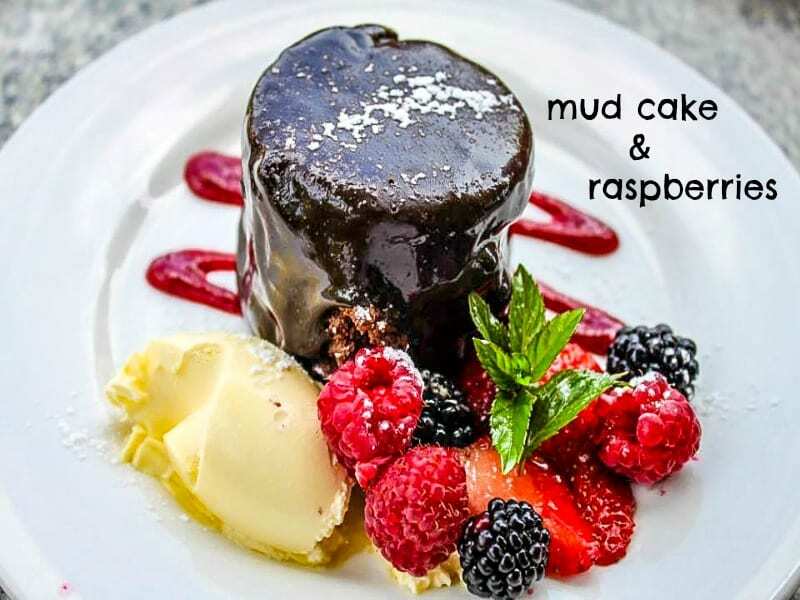 Other foodie stops worth considering nearby include Ashgrove Cheese in Elizabeth Town (handmade and award winning), The Cherry Shed in Latrobe, and for the total chocolate experience visit the House of Anvers in Latrobe (try the Aztec hot chocolate). Booking.com has 600 properties in Tasmania including hotels, apartments and hostels. You get free cancellation on most rooms and a best price guarantee. Tasmania is the perfect destination for homestays and apartment rentals. Check Airbnb for great deals. Skyscanner is a comparison site that searches millions of flights. Once you find your best deal, you book directly through the airline or agent (no extra fees). RentalCars.com is the world’s biggest car rental booking service that compares all the major brands like Hertz, Avis, Alamo, Enterprise and Europcar. Get Your Guide is our trusted provider for tours and attraction tickets. They offer things like easy cancellation, wide range of selection, last minute availability and mobile vouchers. Here are a few multi day tour options in case you can’t rent your own car. 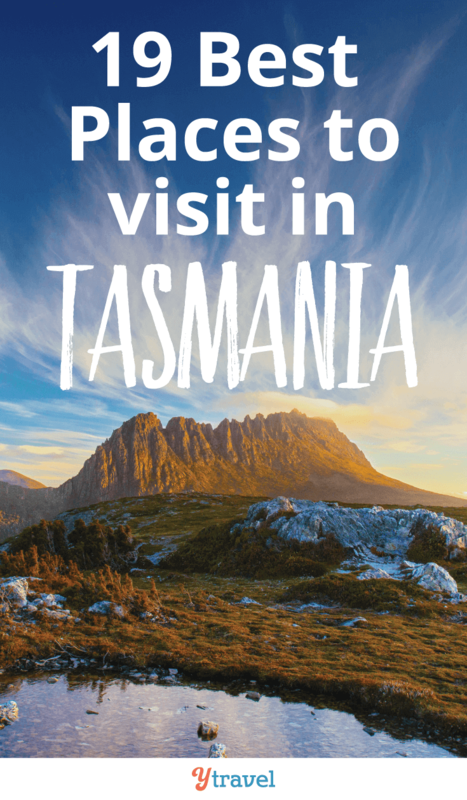 Plan your trip to Tasmania with help from this Lonely Planet guide. 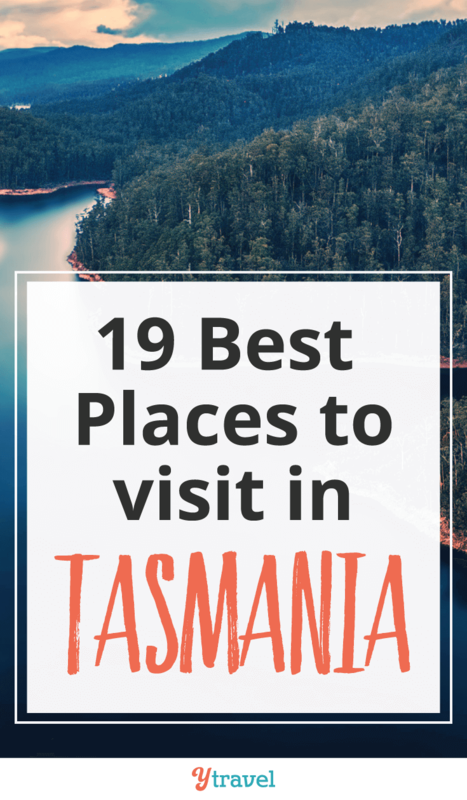 What places in Tasmania would you add to this list? Please share in the comments below. Happy to help with planning Tara! Perfect timing!! We are in the throes of planning a driving trip around Tassie later on in the year. I can now use this as my reference. Thanks guys! Cheers Kathy. I know you’ll enjoy your trip to Tassie. Hope you cam fit many of these places in! I’m always in awe of the natural beauty of Australia when I read your posts. Tasmania looks absolutely gorgeous and also quiet and peaceful. Yeah it’s a pretty state that’s for sure, and not overcrowded, definitely a relaxing pace down there! Superb blog, with mesmerizing images. I like your blog post. Australia is a beautiful Country. Hope you visit one day! These photos are beautiful! I have been thinking of planning a trip to Tasmania and am fascinated by the Bay of Fires. Thanks for the inspiration. I’ve been to most of these places but the photos still always take my breath away. My partner comes from Tassie so we plan to head back there quite frequently once we get set up in Brisbane! Cool. Hopefully we can make it back too sooner rather than later. My friend came from Tasmania to Holland. Can’t imagine why if I look at these pictures 😉 really awesome! Tasmania seem to be a very nice island and the food look so delicious … You’re surely very lucky, thanks for the share. Was very impressed with the quality of food and wine. A highlight! Fantastic post! I really want to visit Tasmania and there is a chance I’ll make it over this year (combining it with a possible business trip to Sydney). Fingers crossed! Australia’s largest, most intact collection of 19th century buildings are located right here in Launceston. Great place, Deserves atleast a visit. I with my partner Maggie have visited Tassie several times over the past 12 years and have seen a lot of the countryside. 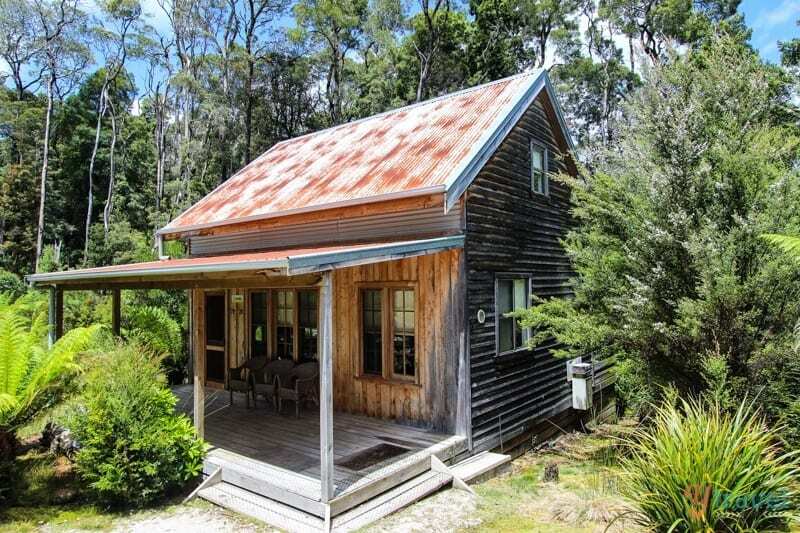 We liked Deloraine so much that we have bought a property there for our retirement . At this time I am planning an 11 day road trip in January 2016 with my 2 sisters and their husbands , one living in New Zealand one in Brisbane. I have just sent to them the link to this page which I am sure they will enjoy viewing . We just booked our flights to Tasmania for next Feb and are staying for a full month. We’re taking our trekking bikes and plan on cycling from Launceston to Hobart along the east coast in about 10 days. Afterwards we’re doing the Overland Trail and for the rest of time, we’ll see. We’ve been looking forward to this trip forever but the time never seemed right – now we’re getting ready for it, can’t wait until it’s Feb! Tasmania looks like quite the place to visit, I’m putting it down on the list of places to go. I especially like cradle mountain, it looks so serene. Thanks for the post . No words to tell about pictures. Beautifully written. We were just wondering where to go on holiday when your post popped onto my radar. So I think with this amount of wonderful information at our disposal, why would we need to look anywhere else? I love that you’ve mentioned places off the beaten track as well. Great tips, thanks, my favourite place (at least from the pictures) is Binalong Bay. And I think there would be no power to take me away! Hope you make it to Tasmania Rekha. It’s beautiful. You nailed some great places in your list, though you completely missed the north-west of Tassie. There are some stunning places there too. I’ve just spent 8 weeks touring Tasmania and have been enthralled by the magnificent scenery and history. You only have to drive one hour and you are somewhere, it’s a photographic dream! Thanks Craig for this good post, I like all places but Bruny island is my favorite. Mainly to visit National parks .wildlife park. Do you have any advise . 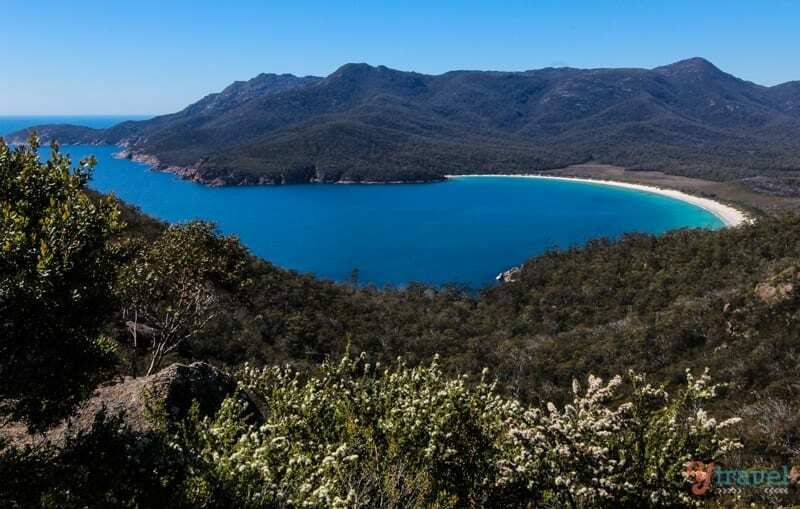 This is a wonderful blog which describes the 19 tourist places of Tasmania which is the smallest territory of Australia. I have been to Australia in 2000. But I haven’t been to Tasmania either. I haven’t repent because you have described almost all the important places in Tasmania by both images & videos. Its a splendid job indeed. Also you have mentioned some websites describing about Accommodation, Flights & Car Rental information which is very much important for an traveler indeed. I hope I will go there in future at any cost. Glad you find the information useful on places to visit in Tasmania. Hope you get to experience it all. Hey Richard. Thanks for reading. Yes, there are some incredible places to visit in Tasmania. 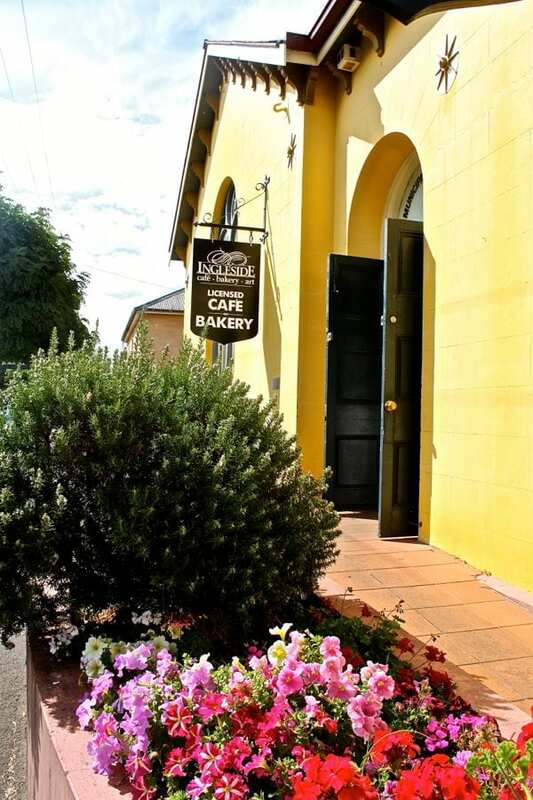 There’s so many places I’d add – Deloraine for it’s interesting shops and street art, Chudleigh for the whole bee and honey experience, & Mole Creek as an lovely little town in front of the best scenic background. Sheffield for its murals. And down the middle, there’s amazing history in Ross and Oatlands – the mill in Oatlands a must see. At least three months is needed to do justice to all Tassie has on offer. We are thinking of crossing to Tassie this year and your site has certainly given me a good insight on what we should be planning and gauging how long we need to stay, so often it has been found that time limitations have you saying, I wish we had have spent more time…. now we don’t have restrictions. Your website is a very useful discovery as we are planning a 1 week or so side trip to Tasmania in September out of a six week trip from UK to visit family in Sydney. me my wife anf two young daugters are picking up a campervan in hobart and was wondering if you have an itinery for us to follow? we have 11 days to play with and going on 17/4/17 would we be better off just following the coast? any tips advice would be wellcomed. Could someone tell me the best place to stay for 1-2 nights after Tamara valley . We will be on our wat to Stanley. Would Devonport be the most interesting? Hi Debbie, personally I don’t think Devonport is that interesting. We enjoyed a few nights in Penguin and explored the surrounding area from there. So consider staying there on your way to Stanley. I think Penguin would be better. We weren’t that excited about Devonport. Give me the prices and direction for my Plan. Great guide. Me & my friends will be going to Tas for 8 days this coming early July. Our headache is whether Hyundai Imax will fit us and our luggage? For driving Hiace (12 pax van), is a Full car license sufficient or required a GDL (Goods Delivery License) instead? Hope someone able to let me know on vehicle rental. Can’t wait to touch down on Tas!! I’m not familiar with Cockles Creek. Hope this helps. This is a great list and I totally agree, but if you have time I would add a trip to Maria Island to the list. Amazing walks around this pristine island with friendly wombats to greet you! Shame you didn’t venture to the wild and rugged north west coast! Arthur River in the Tarkine Wilderness is a highlight for many tourists. Put that on your bucket list ! We are going there in September. One of my sisters travelling with me has a little trouble walking long distances or steps. Also I’m looking for places along the way that cater to gluten free. We enjoy pub food and local cafes too. Do you have any suggestions please? I’m gluten free and I was fine finding things to eat. I can’t remember any places off the top of my head though. If you click some of the links in the post that relate to the area in Tasmania you are visiting, you may find some places to eat mentioned in those places. Fantastic site. My partner and I are doing Victoria as well, so only in Tasi for about 8 days, so I’m using this as a guide. It’s brilliant! Tasmania second most beautiful place l been for my landscape photography except of New Zealand. I nearly cover most places arm my Nikon camera. Heading back next year arm.with my cameras to capture more of there beautiful landscapes , just can’t wait. We’re planning 6 days in Tassie in Jan-Feb. typcially when we travel we find an Airbnb or flat rental. We like to get into one or two local towns and really experience what they have. We were considering Richmond, but would like your opinion about what you might recommend. Also, if we don’t spend all of our time in one place, where would you recommend in the Northeast?